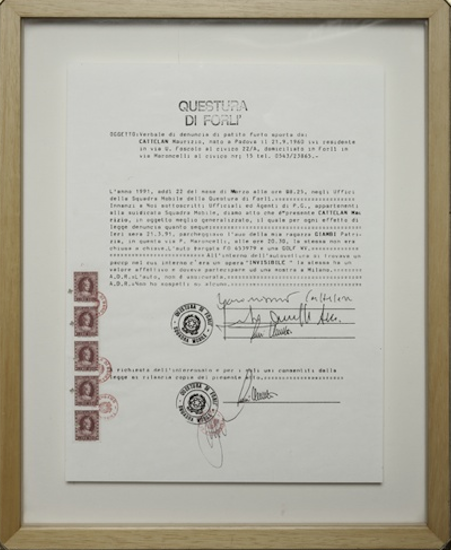 The idea of presenting an existing document as art – the essence of Keith Arnatt’s Notes from Jo – is something used in a very different way by Maurizio Cattelan. In this case the actual document is presented rather than a photograph; given that the document in question is a police report this seems like an important element of the work. This is a work that is all about the narrative it represents: in 1991, faced with not having produced the work for a forthcoming exhibition, Cattelan went to the police and reported the theft of an invisible artwork. He then presented the police report in the exhibition. This work appeals to me in the main because it makes me laugh – something that is very often true of Cattelan’s work, which I’ve written about a couple of times before (here and there) – and I can’t help somewhat admiring the audacity of the artist. But I also think it does raise interesting questions about the nature of art. Certainly this work was one of the pieces I found most interesting in the Hayward Gallery exhibition Invisible: Art About the Unseen 1957-2012 which I saw a while ago. Made at the start of the 1990s, the work of course draws on the practices of conceptual artists in the late 1960s – such as Keith Arnatt, then making very different work – in terms of the document as art but the invisibility of the stolen work could also be seen as referencing even earlier works (Rauschenberg‘s Erased de Kooning (1953) for instance or Yves Klein‘s various explorations of the void from the late 1950s and early 1960s). There are also connections with other works that present both artefacts and data as art and with ideas of fiction as the basis for art. It’s unusual for me to only include a single image in a post. Somehow though, it seems appropriate in this case. The lost work was invisible after all. This entry was posted in Ideas, Text and tagged art, document, invisible artwork, Maurizio Cattelan, police report, text, theft, Untitled (Denunzia) by Ann Jones. Bookmark the permalink. Made me think also (re 60s) of Yoko Ono’s Grapefruit – art as ‘instructions’ for an artwork that remains ‘invisible’, as an idea. Very interesting. Yes, there were a couple of Yoko Ono instruction pieces in the Hayward Gallery Invisible show; there’s definitely a connection conceptually.